Home > SPORTS > Young cricketer Sandip Lamichhane has got a Car cost Rs. 25 lakhs. Young cricketer Sandip Lamichhane has got a Car cost Rs. 25 lakhs. Young cricketer Sandip Lamichhane has got a car. 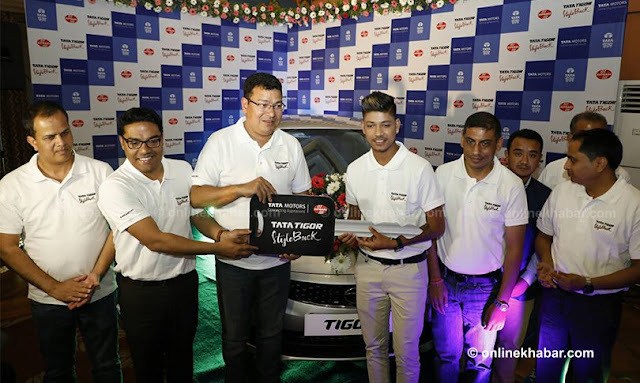 He has got a Tigor car from Tata Motors.Tata's official vendor Sipradi Trading has announced a brand ambassador him for three years. All the car prices will be given by the company. This car cost Rs. 25 lakhs. Shambhu Prasad Dahal, CEO of Sardaradi Trading, CEO Rajan babu Shrestha and Ajit Narayan Singh, Chief Tata India for Nepal transferred the key to the vehicle to Sandeep.